Final construction beam placed on JTA’s future new offices - The Resident Community News Group, Inc. | The Resident Community News Group, Inc.
Jacksonville City Council President Aaron Bowman signs the final beam for the Regional Transportation Center prior to its placement on the building. Nineteen months after beginning construction on phase two of the Jacksonville Regional Transportation Center (JRTC) in the LaVilla section of Jacksonville, a milestone was celebrated Jan. 10 when construction workers with Balfour Beatty hoisted, then affixed the final beam to the building’s skeleton. 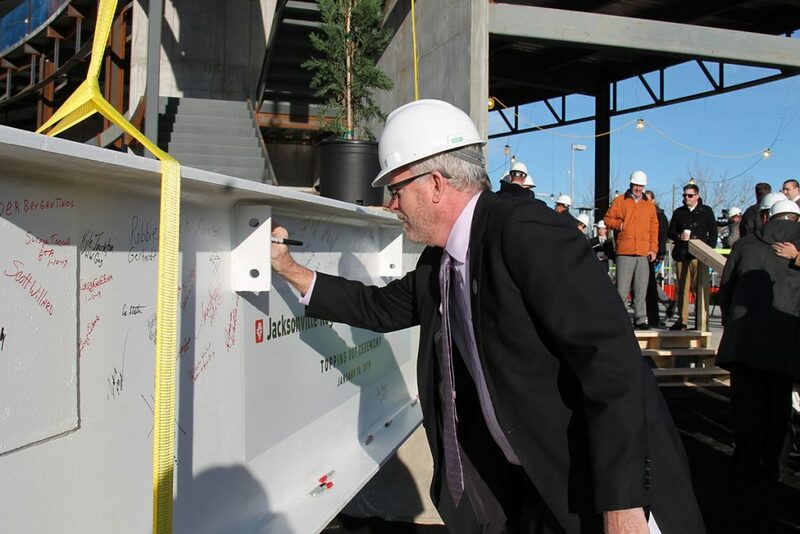 In the topping out ceremony, the beam – autographed by City of Jacksonville leaders, Jacksonville Transportation Authority (JTA) staff, construction workers and other guests – was affixed to the second story of the building where a pedestrian ramp will lead to the Skyway level. Speakers at the frigid morning ceremony included Kevin Holzendorf, JTA board chair; Nat Ford, Sr., JTA CEO; City Council President Aaron Bowman; Dr. Charles Moreland, City of Jacksonville Director of Community Affairs; Steve Moore, president, Vestcor Companies, and Daniel Davis, Jax Chamber president/CEO. The Regional Transportation Center in LaVilla is expected to be completed in about a year. 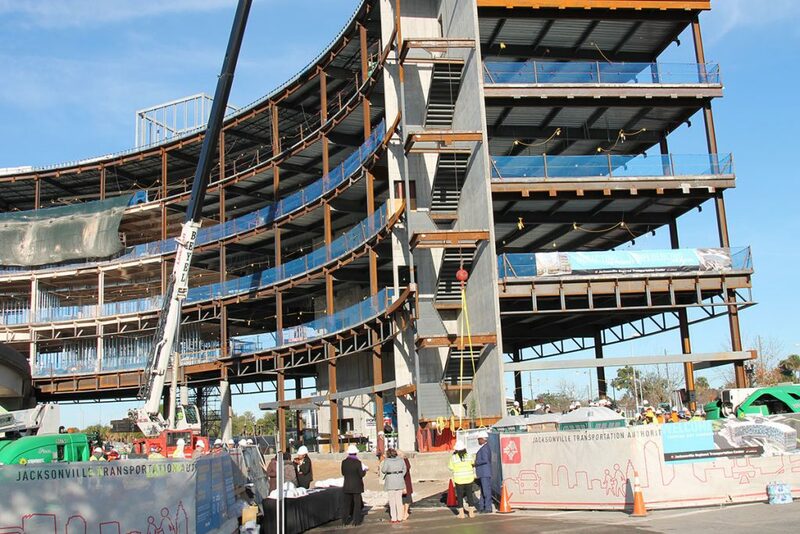 Ford said the topping out ceremony would be the first of many events to come for the JTA. In another year, the JTA expects to be celebrating the completion of the five-story, 40,000-square-foot administration building which will connect to the Intercity Bus Terminal across Forsyth Street with a pedestrian bridge. Before cutting his speech short due to the cold weather, Bowman noted the regional transportation center is an asset which impacts all the counties around Jacksonville. “This is not Chamber of Commerce weather,” agreed Davis. The building will house JTA staff offices, a customer service area, passenger lobby, and areas for local bus transfers, taxis, ride- and bike-sharing, a Kiss ‘n Ride, and a connection to the Skyway/U2C, an automated people-mover system which will transition from the elevated track to street level. The two-phase project began in June 2017 with groundbreaking for the 9,660-square-foot bus terminal, which opened in April 2018 and replaced the Greyhound Bus Station on Pearl Street. Together, both buildings create a $57.3 million transportation hub for intercity, regional and local transportation providers.